I am trying to refi my place. My last refi was unsuccessful because the appraisal was low which put me underwater, which was upsetting because I don’t believe the comps supported such a poor price. So I am at it again. An appraiser came today and I’m very curious what his thoughts are. As a serial refinancer, my appraisals have spanned $400k through $600k. I swear if this doesn’t go through I’m going to sell my place and wouldn’t be surprised if I pulled in $550k which is $100k over what I paid for it. I’ve locked in a 3.5% rate for 20 years. I constantly go back and forth on whether or not to sell my place. I always think that if I hold on for 20 years when it’s completely paid off that we’ll get an extra $1,500 / month which is net of property taxes, HOAs, utilities, bills, maintenance, etc. What a nice extra cushion for us to retire on. But holding on means being a landlord which takes time, and time is money! Also I seem to clash with the owners on how to spend our reserves. I think we need to have our backyard completely landscaped, but at least one of the other owners disagrees. It is such an eyesore, no one wants to spend time back there, yet it has so much potential. Sigh. And if I sell? Freedom! And a big chunk of cash back in our pockets. Check out this graphic from my real estate agent. 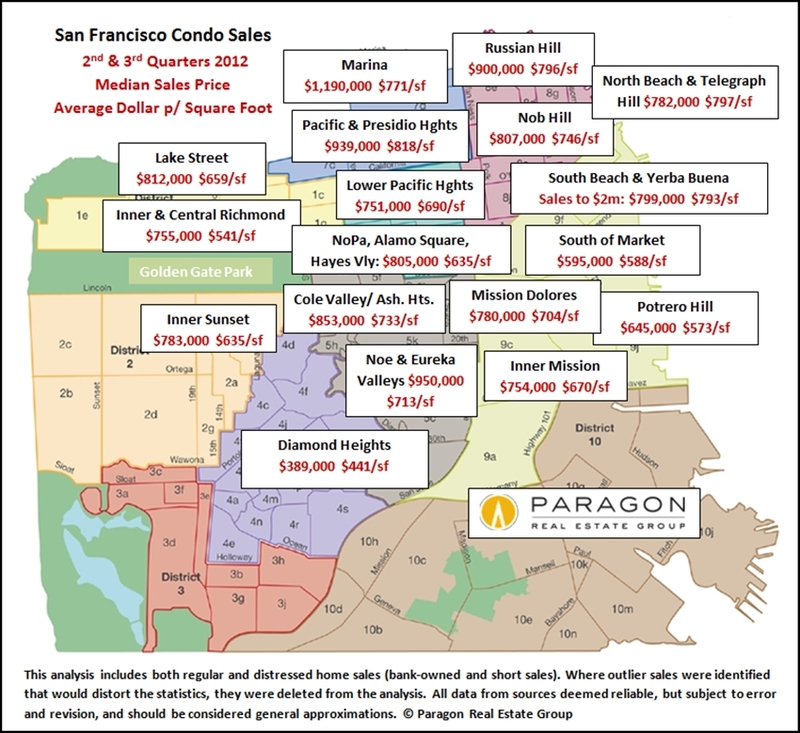 SF condo prices. Can I say…BUBBLE! It may be a good time to sell given the web 2.0 money coming into the city. the other question is, if you’re able to get the money now, would you be able to invest it such that in 20 years, it’ll score you more return than that of renting your place in 20 years. it’s also a good time for other investment markets. I do love refi-ing, it’s comforting to know that if we move out now and rent the place that I could get a positive cash flow out of it.